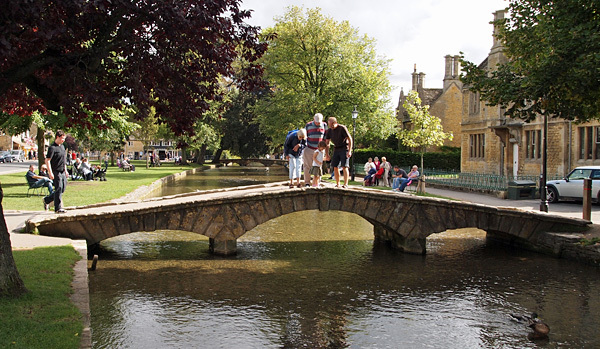 Located on a gentle curve of the River Windrush, Bourton is one of the most visited of all the Cotswold villages. Its tree lined banks and the delightful low arched bridges, that span the river here and there, make this a charming place to wander around. However, it can become very busy during the summer and at weekends due to its popularity. Among the quaint narrow streets lined with fine Georgian houses, lies an array of attractions to suit every age and taste. 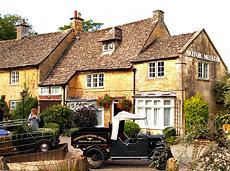 There are various museums, small independent shops, art galleries, a bird zoo, model railway exhibition and even a scale model of Bourton-on-the-Water itself. 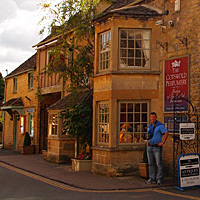 After visiting some of these, you can then relax and be refreshed in one of the many tea rooms and restaurants around the village or maybe enjoy a picnic by the pleasant green banks of the river. The beautiful 19th-c St Lawrence's church, just of the High Street, has a lovely 14th-c Chancel and a Georgian Tower. 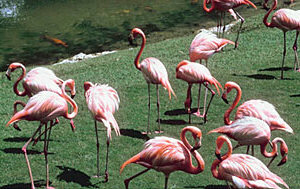 Several acres of gardens, woodlands, rivers and ponds, with hundreds of species of exotic birds, ranging from penguins to colourful parrots and flamingos. Working model railway exhibition with some of the finest operating indoor layouts in the UK. OO/HO and N gauge British and continental locomotives and rolling stock, run over 500+ ft of track, through realistically created small scale dioramas. 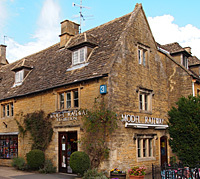 Includes a model and toy shop. Resplendent with old beams and an open fireplaces, the perfumery sells scents, aftershaves and colognes made on the premises. A small scented garden is located at the rear, where examples of plants grown for use in the perfumery process can be seen. 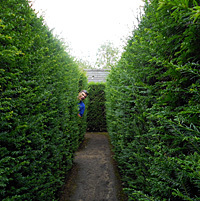 A traditional yew hedge maze but with a twist. The maze has a Rebus style puzzle that you must try to solve as you search for the centre and the secret hiding place of the golden dragonfly. 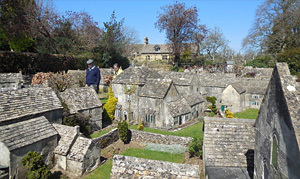 A unique replica of Bourton-on the-Water itself in which everything is reduced to one-ninth of its size. Built in the late 1930s by the landlord of Old New Inn. Located in a fine old 18th-c watermill. Its exhibits include a large collection of veteran and vintage cars, motorcycles, bicycles and historic motoring accessories.